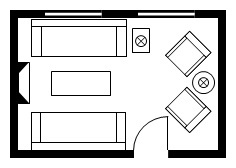 This page deals with kitchen dimensions and kitchen planning guidelines for kitchen layouts. They're based on recommendations for the United States but standards for other modern countries won't be far off. I've included metric conversions. 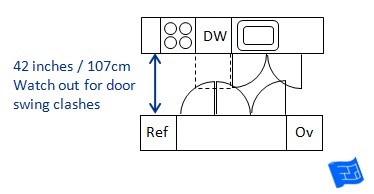 This kitchen dimensions information forms part of the kitchen design layout series. You may also be interested in kitchen cabinet dimensions. This information is provided in good faith to help you think about your kitchen design. The metric dimensions are approximate. It is your responsibility (or your architect / design professional / contractor team) to make sure your dimensions are in accordance with your local code or regulations. Each leg of the kitchen work triangle must be 4 feet (1.2m) or more and not more than 9 feet (2.75m). If you add up the legs of the kitchen triangle this should not be more than 26 feet (7.9m). As you might have read on my kitchen triangle page, I like to think more in terms of kitchen polygons. If you keep to the dimension guidelines for the kitchen triangle your kitchen polygons will be fine. Now I can get into a debate about this. Different sources quote different distances for aisle width. So to sort this one out let’s start by looking at what factors influence the aisle width that you should allow. Whether the space is for one or two cooks. Whether or not there’s circulation passing by a run of units. The door swings of the cabinets and appliances on either side of two runs of units facing each other. So taking into account these factors we can imagine the following scenarios. In this scenario it’s a small kitchen designed for one cook where one wall has no cabinets or appliances. An aisle width of 40 inches (102cm) is adequate in this case. It allows space for the cabinets to be opened and for the cook (or person cleaning up) to move around easily. I think if you were pushed you could go down to 36 inches (92cm) particularly if you don’t have a dishwasher (the dishwasher has the widest door swing). With 36 inches of clearance a person can open a drawer and stand behind it or stoop down to the base cabinets (provided they’ve not been eating too many pies). Another reason for going down to 36 inches is that you could squeeze in a 4 inch (10cm) shelf along the wall – maybe even with a sliding door. 4 inches of shelf space is great for tins and groceries, especially if there’s a lip on the shelf to stop things falling off. This scenario would also apply for other layouts where the obstruction doesn’t have any units. For example here it is with a breakfast bar. I added a wall of thin units at the other wall of the kitchen for extra storage. 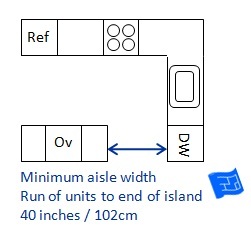 A minimum aisle width of 40 inches (102cm) also applies for a run of units opposite the end of an island. 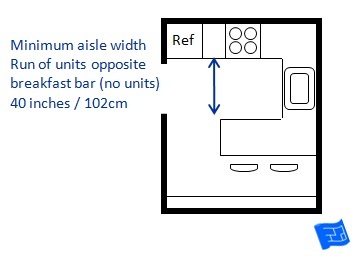 So the standard advice is that if you have a kitchen with one cook working in the kitchen at any one time then you need 42 inches (107cm) of clearance between two runs of units. If your household is the ‘one cook at a time’ variety it’s all too easy to go for 42 inches of clearance. Before you settle on this though, just check your base cabinet / appliance door swings. 24 inch (61cm) base cabinet door swings will clash with each other, and you’ll have even more of a clash with a dishwasher. So it might be worth changing the width of your cabinets and just thinking about door swings before you decide to have an aisle separation of 42 inches. If you have two cooks at any one time in the kitchen you need 48 inches (122cm) of clearance between two runs of units. Now when they say two cooks in my mind this means two people in the kitchen at the same time. Someone might be cooking while someone else is chopping vegetables or making a snack. What I’m saying is that if it’s a family kitchen then 48 inches is probably the clearance you want. Plus there's no problem with clashing door swings. 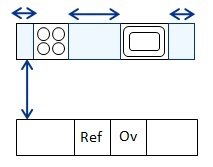 This is the scenario that’s applicable to a galley or L shaped arrangement opposite a table. 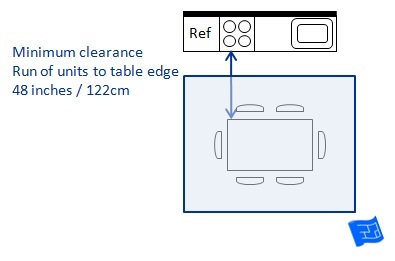 In the arrangement shown above there’s enough room for the diners to be seated – 32 inches (81cm) and a person to work in the kitchen – 40 inches (102cm) making a total of 72 inches (213cm) from the edge of the run of units to the edge of the table. If you’re pretty confident that there won’t be much work going on in the kitchen while people are sitting at the table you could maybe bring this in to 48 inches (122cm). I’ve seen plenty of small family kitchens with a table squeezed in with about 48 inches clearance. A kitchen eating counter is at the same height as the countertop. So it’s 36 inches (92cm) high. Each person needs 24 inches (61cm) width and 15 inches (38cm) depth to eat comfortably. I think 15 inches is the absolute minimum. There’s often other stuff that goes on at the kitchen eating counter like surfing the web on your laptop or doing a bit of paperwork or homework. For offices a desk is at least 30 inches deep (76cm) and the ‘work area’ part of the desk is 16-20 inches (40 – 50cm). It’s just something to think about. If your eating counter is part of a double depth island then you’ll probably have additional room anyway. When you’re looking at kitchen counter stools make sure you buy the right height – 24 inches (62cm). And leave at least 15 inches (38cm) leg space. 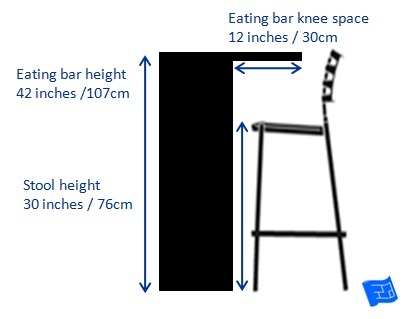 A kitchen eating bar is at the standard bar height of 42 inches (107cm). 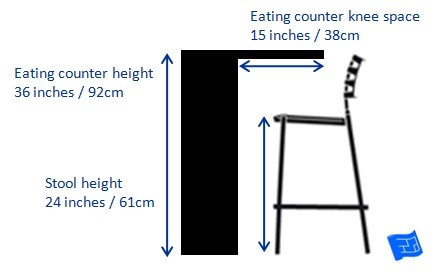 The standards say each person needs 24 inches (61cm) width and 12 inches (30cm) depth to eat comfortably. Personally I think 12 inches is a little thin. I’d still go for 15 inches (38cm) minimum. Again (as per comments above in eating counter section) bear in mind that you might want to carry out other activities on your eating bar (laptop, paperwork, homework). Just have a think about it before you finalise the dimensions. When you’re looking at kitchen bar stools make sure you buy the right height – 30 inches (76cm). And leave at least 12 inches (30cm) leg space. 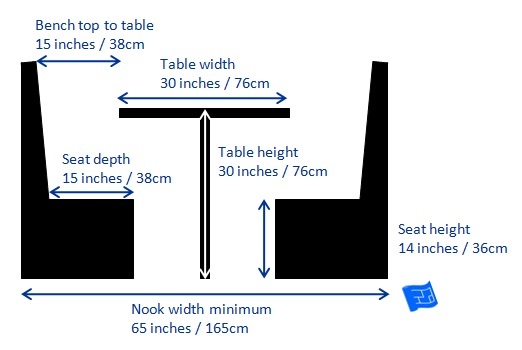 Take a look at my page on dining room design to find out about table dimensions. The same guidelines apply to your kitchen table. What is useful to deal with here is banquette seating and kitchen nook dimensions. The most efficient way to build a kitchen nook is to build it as a booth since this requires the least space. 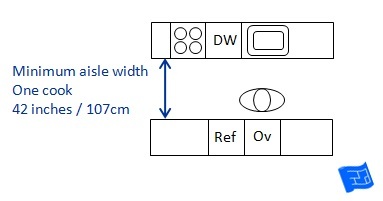 The dimensions given below are for a standard table height nook. You could build it at counter height or bar height, perhaps in an even narrower space. 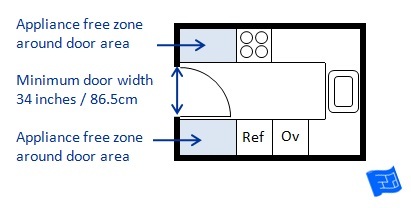 The minimum dimension for a booth or nook is 65 inches (165cm) and this can expand to 80 inches (203cm) with a table width of 30 inches (76cm) which can expand to 40 inches (102cm). 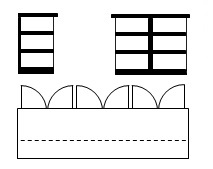 The benches or banquette dimensions have a seat height of 14 inches (36cm) and a seat height of 15 inches (38cm). The backs should be angled back slightly and can be any height, including just a bench with no back. The doorway to the kitchen should be at least 34 inches wide (86.5cm). The door swing should not be in the way of appliances or work areas. If the door swing is taking up too much space you could put a pocket door in instead, or remove the door altogether. Appliance doors should not overlap when open. There are a number of kitchen planning guidelines that specify how much space should be left around the range, oven, refrigerator, preparation area and sink. Generally if you distribute the areas and appliances around the kitchen using the kitchen triangle dimensions rules this should provide for good landing areas around all the main appliances. In smaller kitchens it may not be possible to accommodate all of these guidelines. There should be 36 inches (92cm) on one side of the main sink and 18 inches (46cm) on the other side of the sink. 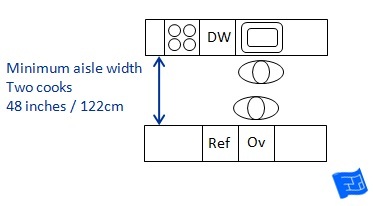 The 18 inches side may be integrated into the sink as a draining board. If you're working with a small kitchen space a drying rack above the sink could work instead of having a landing area to the side for drying. A continuous counter top surface of 36 inches (92cm) and 24 inches (61cm) deep next to a sink is required. This can be combined with the 36 inches sink clearance area in smaller kitchens. Many kitchen guidelines specify that the dishwasher should be placed near the sink. This makes sense because it allows all dirty dishes to be set down in one location near the sink and perhaps pre-rinsed before going into the dishwasher. What many other guidelines don't point out is that the location of the dishwasher in relation to the cutlery and crockery storage locations is also important. It's a great advantage if you can unload the dishwasher and put away the cutlery and most of the crockery without walking too far. The dishwasher door should be placed at least 21 inches (54cm) away from any cupboards perpendicular to it. This means that there is standing room beside the dishwasher door and the cupboard doors all around it can be opened sufficiently while the dishwasher door is down. A landing area of 15 inches (38cm) and 12 inches (30cm) on either side of the cooking surface is recommended. If the cooking surface is located on an island the counter top must extend a minimum of 9 inches behind the cooking surface. You don't want your kitchen going up in flames when you're doing a bit of flambée so there are recommendations for vertical clearance. 24 inches (61cm) of space is recommended from the cooking surface to a non-combustible surface above it. If the surface is combustible then code requirements dictate that at least 30 inches (76cm) between the cooking surface and the surface above. 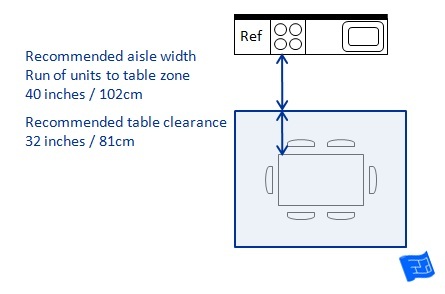 If a microwave hood combination is being used follow the manufacturer's specifications. Do not place the cooking surface in front of a window that can be opened. When placing the refrigerator consider the door swing. 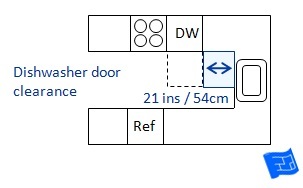 Ideally the refrigerator door should open on the side that is orientated towards the main preparation area. If the refrigerator is placed near to a wall and the door opens onto the wall it may be necessary (depending on the hinge of the refrigerator door) to include a space buffer (perhaps a thin cupboard) to allow the door to open fully. If the door can’t swing fully open there will be problems getting shelves in and out of the refrigerator when it’s time for cleaning. A minimum amount of counter top frontage of 158 inches (402cm) is recommended in some kitchen guidelines. This can include the frontage taken up by the cooking surface and sink. In all the kitchens I have experienced this is an ample amount for a very functional kitchen for one cook.